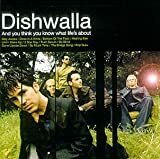 These are lyrics by Dishwalla that we think are kind of repetitive. Why are you so interested in other people's thought on God? You ask them to tell you about 'Her' over and over in this song!